Speaking of jewellery this Valentines I've teamed up with Mococo my favourite online retailers for shopping affordable designer jewellery and they've kindly gifted me a beautiful Thomas Sabo Silver Pave Heart Necklace RRP £70.00 and I'm going to give it away to one lucky BBA reader (as heart shaped jewellery isn't something a girl buys herself!). 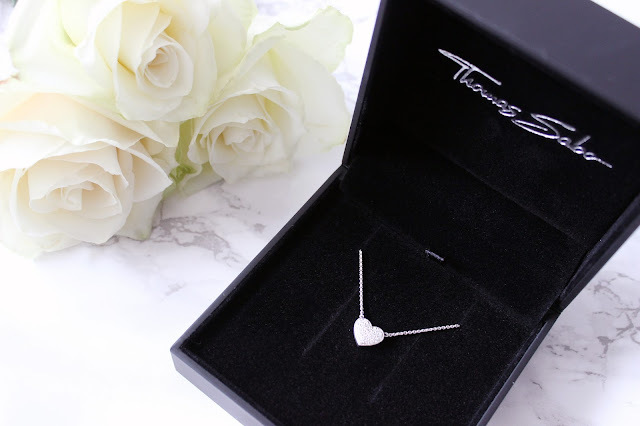 Personally I'm very selective when it comes to jewellery, but what I particularly like about this Thomas Sabo necklace is that not only is it simplistic, the heart pendant is delicate and dainty without looking or feeling cheap. To enter and be in the chance of winning, all you need to do is follow the instructions on the Rafflecopter widget below. There are two compulsory entries; you must be following British Beauty Addict via Bloglovin' and Mococo Jewellery via Twitter. But I've also added a few additional entries, if you fancy increasing your chances of winning. The giveaway is open internationally and ends on 19/02/2017. One winner will be chosen at random and all entries will be checked.